Messier 46 is a relatively bright, large cluster containing about 500 stars. It occupies an area of 27 arc minutes of apparent sky, almost the size of the full Moon, and has a spatial diameter of 30 light years. The cluster’s estimated age is 300 million years. M46 is moving away from us at 41.4 km/s. The cluster has an apparent magnitude of 6.1 and lies at an approximate distance of 5,400 light years from Earth. It has the designation NGC 2437 in the New General Catalogue. Messier 46 is easy to see in binoculars and small telescopes. It can be found using Sirius, the brightest star in the night sky, as it lies roughly in the same area. 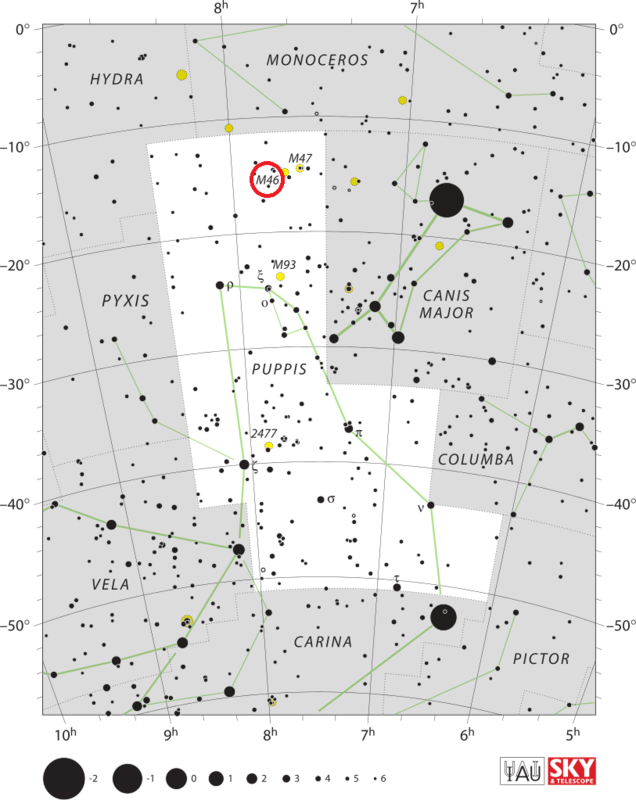 M46 is located 14 degrees east and 2 degrees north of the Dog Star. 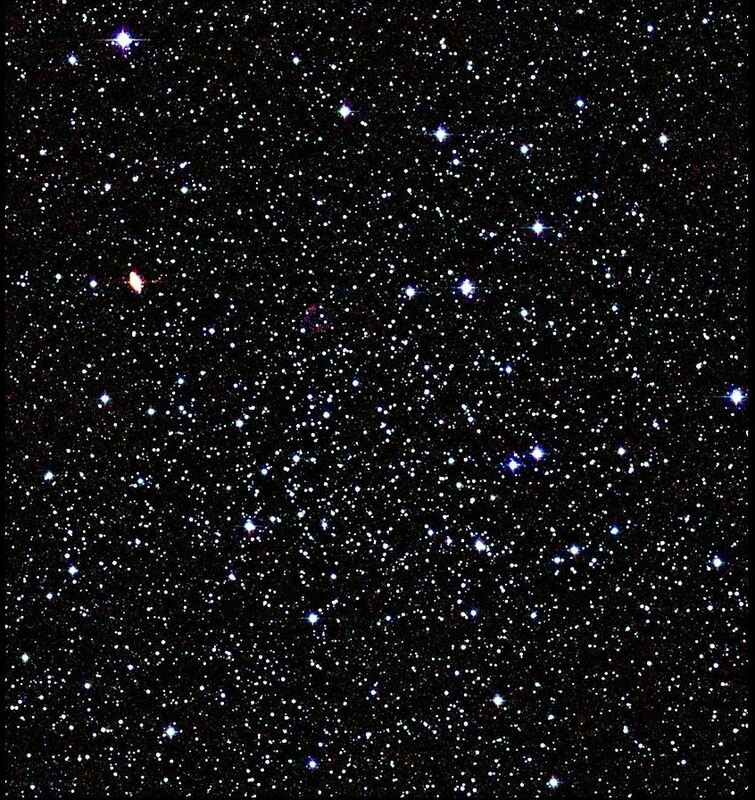 In 10×50 binoculars, the cluster appears hazy and almost like a nebula, but larger binoculars reveal a large open cluster with about 50 dim stars. Larger telescopes show a field of faint stars that are very similar in brightness. Messier 46 is a densely populated cluster. About 150 of its members are of magnitude 10 to 13 and the brightest stars belong to the spectral class A0. These stars are about 100 times more luminous than the Sun. The single brightest star in M46 has a visual magnitude of 8.7. The cluster is classified as Trumpler type II,2,r, which means that it is detached from the surrounding field, but its stars are not very concentrated toward the centre (II), the stars have a moderate range of brightness (2), and the cluster is richly populated (r), with more than 100 confirmed members. 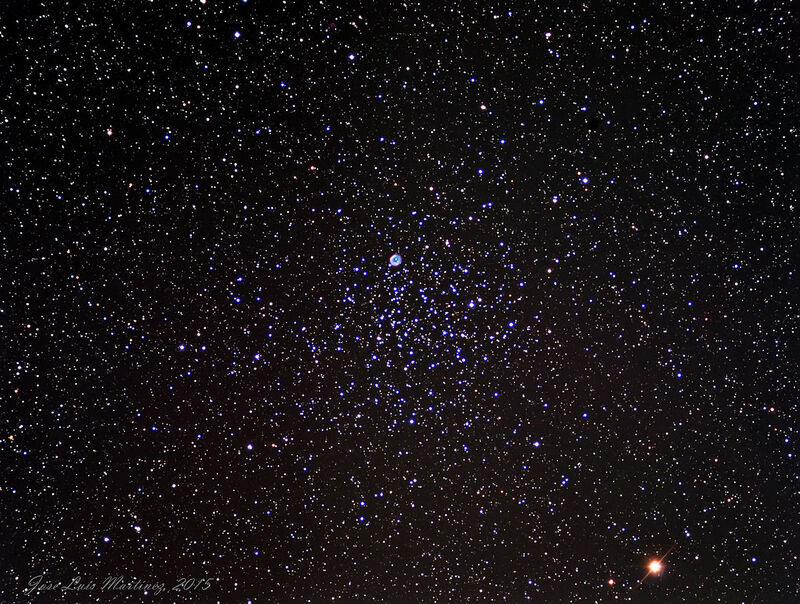 Messier 46 is located in the vicinity of Messier 47, another bright open cluster in Puppis. The two are separated by about a degree of apparent sky and can be seen together in a binocular field of view, or a wide-angle telescope view. M47 lies just to the west of M46. Both clusters are easily seen in small telescopes. 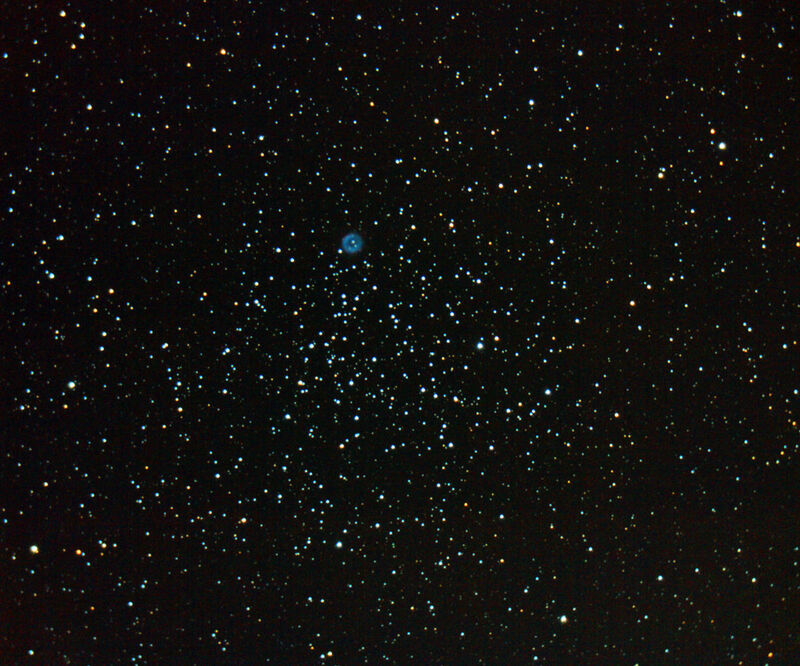 M46 contains more stars, but is considerably fainter than M47 because it lies at a greater distance. 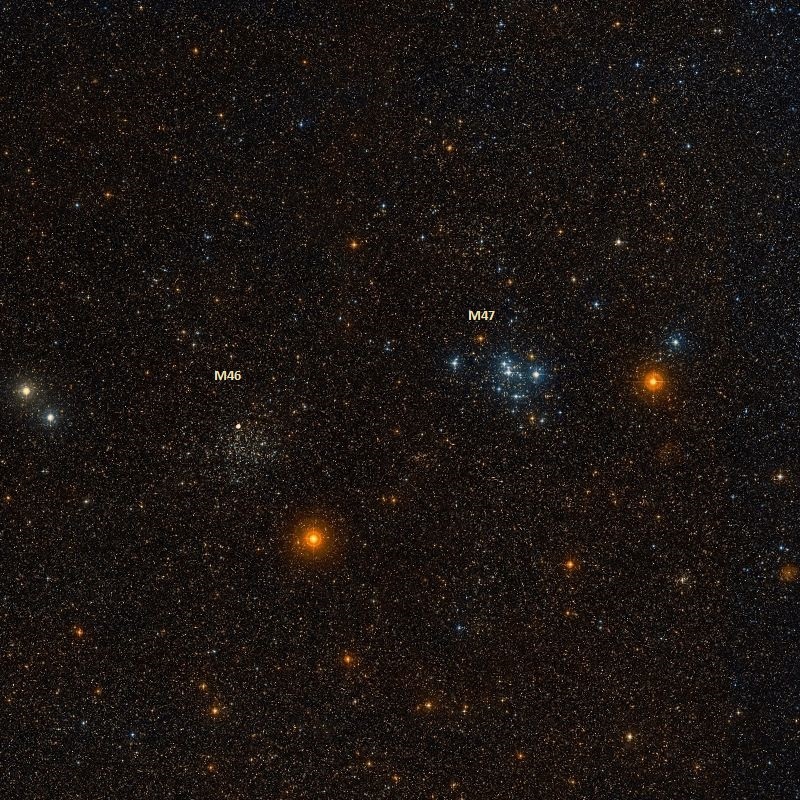 Puppis is home to another open cluster catalogued by Messier. Messier 93 can be found about 9 degrees to the south of M46 and M47. NGC 2423, a 7th magnitude open cluster not included in Messier’s catalogue, can be seen only 0.5 degrees north of M47. The planetary nebula NGC 2438 appears superimposed on M46 and is located about 7 arc minutes northeast of the cluster’s centre. The nebula is believed to lie in the foreground, at a distance of about 2,900 light years from Earth. It is receding from us at 77 km/s and, as it doesn’t share the cluster’s radial velocity, it is most likely not physically related to it. Messier 46 was one of Charles Messier’s original discoveries. Messier first observed the cluster in 1771, after he had already published the first edition of his catalogue. He added M46, M47, M48 and M49 to the list on February 19, 1771, only three days after presenting his catalogue to the academy. Herschel later added the cluster to the General Catalogue as GC 1564 and the nebula as GC 1565. Messier 46. Atlas Image obtained as part of the Two Micron All Sky Survey (2MASS), a joint project of the University of Massachusetts and the Infrared Processing and Analysis Center/California Institute of Technology, funded by the National Aeronautics and Space Administration and the National Science Foundation. A very delicate double star in a fine cluster, outlying the Galaxy, over Argo’s poop. A 8 1/2 [mag], and B 11, both pale white. A noble though rather loose assemblage of stars from the 8th to the 13th magnitude, more than filling the field, especially in length, with power 93; the most compressed part trending sf [south following, SE] and np [north preceding, NW]. Among the larger [brighter] stars on the northern verge is an extremely faint planetary nebula, which is 39 H. IV. [NGC 2438], and 464 of his son’s Catalogue. This was discovered by Messier in 1769, who considered it as being “rather enveloped in nebulous matter;” this opinion, however, must have arisen from the splendid glow of mass, for judging from his own remark, it is not likely that he perceived the planetary nebula on the north. WH [William Herschel], who observed it in 1786, expressedly says, “no connexion with the cluster, which is free from nebulosity.” Such is my own view of attentively gazing; but the impression left on the senses, is that of awful vastness and bewildering distance, – yet including the opinion, that those bodies besprangled the vastness of space, may differ in magnitude and other attributes. To fish up this object, an occult line must be carried from Alpha Leporis through Sirius, and extended 13 1/2 deg, or nearly as far again, to the eastward; where a glance from Castor over Procyon passes through it. In the following [eastward] field there is a coarse pair of 7th magnitude stars, lying sf [south following, SE] and np [north preceding, NW] to each other. Argo’s poop in Smyth’s note refers to the constellation Puppis, which used to be part of the much larger constellation Argo Navis. Argo Navis represented the ship of the Argonauts and was divided into three smaller constellations – Carina (the keel), Puppis (the stern) and Vela (the sails) – by the French astronomer Nicolas Louis de Lacaille in the 18th century.